Length of Boat: 23' 5"
Total Weight Capacity: 16 people or 2,400 lbs. The X-35 touts the infamous MasterCraft pickle fork design, originally created to supply more bow room and to give your water dwellers another entry point with its convenient bow ladder. But beware, imitators are lurking so be sure to get the original inboard pickle fork design. 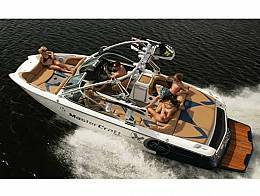 The X-35 was designed to put I/Os to shame, especially since it has been loaded up with amenities, one of which is the newly designed MasterCraft Passenger Seat that allows the co-captain to adjust their seat to look forward or aft. The X-35 has unparalleled storage thanks to its incredibly deep hull design which means you can fit more big stuff in your boat!